Fifa says it paid $10m (£6.5m) to a Caribbean football body led by Jack Warner, who is charged by the US with corruption, at South Africa's request. South Africa's instruction was that the money was for a Diaspora Legacy Programme which should be "implemented directly" by Mr Warner, Fifa said. The US says the $10m was a bribe in exchange for Mr Warner supporting South Africa's 2010 World Cup bid. Mr Warner and South African officials have denied any wrong doing. 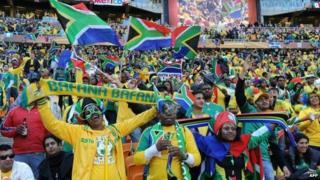 South Africa won the bid ahead of Morocco to become the first African country to host the World Cup. Mr Warner hails from Trinidad and Tobago and was the president of the Confederation of North, Central American and Caribbean Association Football (Concacaf) and vice-president of Fifa when the decision was made. He was among a string of Fifa officials arrested last week after the US and Switzerland launched separate investigations into corruption in Fifa, the world football governing body. In a statement, Fifa said South Africa's government approved a $10m project in 2007 to "support the African Diaspora in Caribbean countries as part of the World Cup legacy". The government, in agreement with the South African Football Association (Safa), asked Fifa to "process the project's funding by withholding" $10m from the Local Organising Committee (LOC) of the World Cup, the statement added. "Fifa did not incur any costs as a result of South Africa's request because the funds belonged to the LOC. Both the LOC and Safa adhered to the necessary formalities for the budgetary amendment," it said. Martyn Ziegler, chief sports reporter for the Press Association, has tweeted a 2008 letter from Safa to Fifa secretary general Jerome Valcke, who has denied involvement in the scandal. The letter, written by then Safa president Molefi Oliphant, requests that the money should be sent to the Diaspora Legacy Programme to be "administered and implemented directly by the president of Concacaf". A Fifa spokesman told the BBC in response to the letter that the football governing body wanted to reiterate that Mr Valcke and other members of its senior management were not "involved in the initiation, approval and implementation of the diaspora project". The Fifa statement did not comment on another US allegation - that a senior South African official travelled to Paris to hand over cash in $10,000 stacks - in a hotel room, to an unnamed person working for Mr Warner. South Africa's government and Safa have denied any bribes were paid.